Back By Popular Demand are our Volume Discounts for customer orders. You have spoken and we have listened. Stop on by our website to see how low our prices have gone. 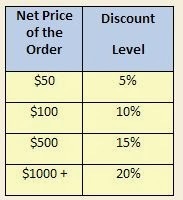 Here is a summary of how our discounts work. The Primary Mission Statement of Dean’s Cards, or our purpose for being, is to “make vintage card collecting fast, easy and fun”. Two of the many things we do to enable this is to “offer conservatively graded vintage cards at competitive prices”. Another goal that we have is “to strive to stock at least one of every vintage card online, in each of the popular grades in stock”. 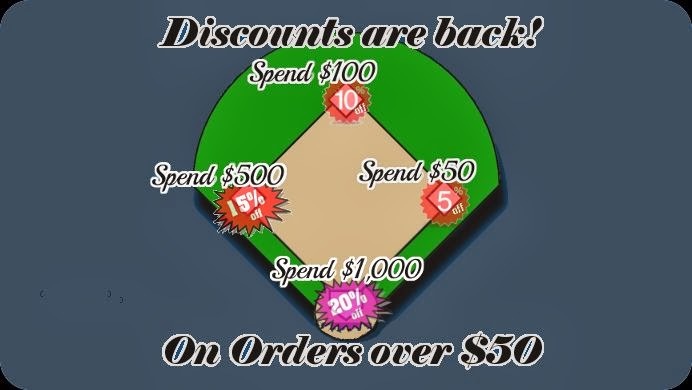 The Dean’s Cards Surplus Inventory Discount, often referred to simply as “Inventory Discounts”, help us to achieve each of these objectives. 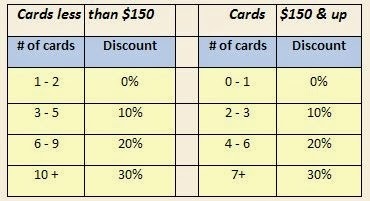 The idea of the Dean’s Cards Inventory Discounts is simple. Dean’s Cards has over a million cards online. We buy and sell thousands of vintage cards each week. The as the quantity of an “item” (a card, in a particular grade) in the Dean’s Cards Inventory increases, it triggers a higher Inventory Discount and lowers the net price of the item by 10%. When Dean’s Cards decreases or sells out of a certain item, the Net Price of that item increases. The higher price is then reflected in our Dean’s Cards Bid Software, which allows us to bid more aggressively and replace the items with low quantities. We strive to be your “one stop shop” for vintage cards. The Inventory Discount applies only to the cards from before 1981. It also applies to all magazines. As the dollar amount or volume of your order increases, so does the percentage of your volume discount. Volume Discounts begin at $50 and top out at 20% when the invoice amount (net total after Inventory Discounts are applied) reach $1000. Volume Discounts are based off the Total Net Price of the items in an Order, before tax or shipping charges. With these two discounts, you can rest assured that you are getting our best prices. You also get the benefit of knowing that we do not give any other discounts, to anyone, on any product - under any circumstance. Dean’s Cards was founded in 2001 and we have never made an exception to this policy. The reason for this policy is simple: Our customers know that they are getting our best price, so they know that they do not have to contact us to negotiate on every order. This is all part of making buying from Dean’s Cards fast,easy and fun. From our perspective, with the amount of business that we do on a daily basis, we would be overwhelmed by the number of inquiries.